In recent years, U.S. Postal Service management and lawmakers have spoken of the need to make changes that “reflect the reality” of a world in which the demand to send mail has diminished. Augmented reality requires four tools: back-end software, a mobile phone, an application and an Internet connection. AR users often wear glasses that display the digital layer of information, but they can also use the camera on their phones. Developing the software and buying new devices would require a steep investment by the Postal Service -- AR glasses range from $400 to $1,500 a piece -- but the efficiencies they can bring about would outweigh that price, the IG said. Letter carriers could benefit the most from an investment in augmented reality. With AR glasses, they could better load and unload their vehicles. While looking at the back of their truck, the glasses could add a layer of information displaying exactly where the letter carriers should place each package (see the IG’s illustration of this process below). 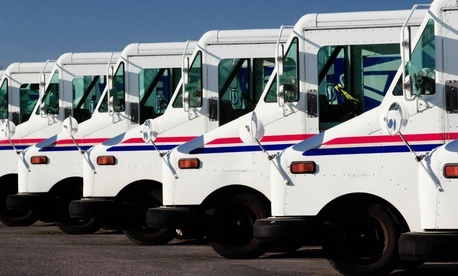 Mail deliverers spend more than 5 percent of their time loading and unloading mail, the IG said, not including the initial loading at the beginning of each shift. More efficient loading and unloading could reduce the need for overtime, leading to dramatic savings for the Postal Service. A digital display instructing postal employees on how to fix their vehicles could save $39 million annually, according to the report. Directions could be projected onto postal workers’ windshields, leading to safer and more efficient driving. Augmented reality could also directly benefit postal customers. The IG suggested a facial recognition program, in which letter carriers would take a picture of a package recipient with their AR glasses to verify it is going to the proper person. Mail users donning their own AR devices could find assistance in choosing the right box to ship something and better track their packages to ensure they are home for delivery. The idea of augmented reality is not entirely new to the Postal Service; USPS has encouraged its mailers to use AR technology on their products, such as catalogues. The agency has experimented with its own use of AR, launching stamps in 2013 that when viewed through a mobile device’s camera become animated. Mailing agencies in foreign countries, such as those in the United Kingdom and Sweden, have launched programs similar to those the IG suggested for USPS. The IG proposed USPS roll out pilot programs to evaluate the “operational feasibility and financial viability” of the various AR opportunities. A spokeswoman for the Postal Service said the agency is still reviewing the IG’s findings.